I have a confession. I am no hamburger fan. If there is a cookout, I always hope there are hot dogs served so I have something to eat. I didn't eat my first burger until college. And that was a 29 cent hamburger from McDonald's. If forced to eat a burger, I prefer it to be of the McDonald's variety, super thin meat on a bun. The idea of a thick and juicy burger grosses me out a bit. So needless to say, I was a bit worried when I received the Shake Shack Burgers in the swap from our hostess, Taste of Home Cooking. I did know that everyone else would enjoy the burgers, but I was worried about how I felt about them. The sauce was very Big Mac-esque (a positive thing for me) and I did make my burger at least half of the recommended size. It was good. Combine mayo, ketchup, mustard, chopped pickle, garlic powder, paprika and cayenne in a bowl. Set aside. Form the ground beef into 4 patties. Sprinkle the top side heavily with salt and pepper. Split the buns and spread the softened butter on the tops and bottoms of all 4 rolls. Place under the broiler or toast until golden brown. Once toasted, top with 1-2 teaspoons of sauce on each bun. On the top bun, add one leaf of lettuce and one slice of tomato. Set prepped buns on parchment paper. When the grill is heated, place the burgers on the grill seasoned side down. Using the back of a spatula, flatten the patties to 4 inches wide. You want the beef to stick and get a nice crust. Season the top side with salt and pepper. Cook until crisp crust forms, about three minutes. 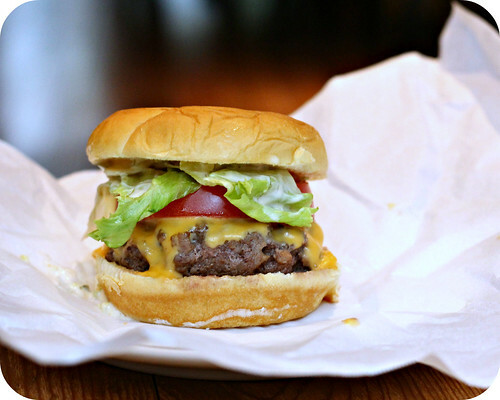 Flip burgers and top each with one slice American cheese. Cover and cook until cheese melts. Transfer patties to bottoms of burger buns and cover with toppings and bun tops. Wrap in parchment paper and let sit for 1-2 minutes to let the juices from the burgers sink into the buns and the sauce to meld with the other toppings and cheese. Don't skip this step, it really makes a difference! Unwrap and serve immediately. We loved these burgers! Your picture looks great! Yum! I've been meaning to make these! I LOVE burgers. Can't believe I still haven't made this! Looks good! I've had these burgers on my "must make" list for a little while. I need to try them very soon. I'm the same way about burgers-I usually prefer turkey or chicken...but these have been on my to-make list for awhile now. Yours look great! Your picture looks great. I've seen these floating around the blog world but haven't made them yet. I need to put these on my menu sometime soon. Ha! I forgot you weren't a burger fan. I'm so glad you made them anyway and that everyone else enjoyed them. We love these - I make my burgers this way whenever we have burgers these days. So easy and so good. Shake Shack just opened up near me and I haven't tried it yet. But these burgers sound delicious!